Background: Complex integrin molecules, composed of eighteen α and eight β subunits, are responsible for modulating different signal transduction mechanisms across the plasma membrane. Two heterodimeric integrins, α4β7 and α4β1 are in the interest of researchers due to their immense importance in regulating a variety of inflammatory diseases such as asthma, rheumatoid arthritis (RA), inflammatory bowel disease (IBD), atherosclerosis and multiple sclerosis (MS). Small molecules α4β7 antagonists selective over α4β1 may be a safe and effective remedy for autoimmune disorders. Therefore, designing new small molecule selective α4β7 antagonists should have immense importance in anti-inflammatory and anti-cancer drug discovery. Materials and Methods: Integrins are discussed in terms of their structural point of view along with their signaling mechanisms. A brief description of the α4β7 and α4β1 antagonists in clinical trials in process or terminated was also highlighted. Firategrast and SB-683698 as dual integrin α4β7 and α4β1 antagonists having N-benzoyl-L-biphenylalanine moiety showed some positive response in clinical trials initially. However, this molecule failed in evaluation due to adverse effects. Hence, compounds with this scaffold may be clinically effective as a drug candidate in future. Therefore, detailed structural analysis of the N-benzoyl-L-biphenylalanines was provided in this study. Conclusion: The Open3DQSAR models on both integrins α4β7 and α4β1 were statistically significant. For integrin α4β7 antagonists, the best 3D-QSAR model resulted in an LOO-Q2 of 0.6240 and an R2 Pred of 0.7366 whereas, for integrin α4β1 antagonists, the best model yielded an LOO-Q2 of 0.7487 and an R2 Pred of 0.5366. 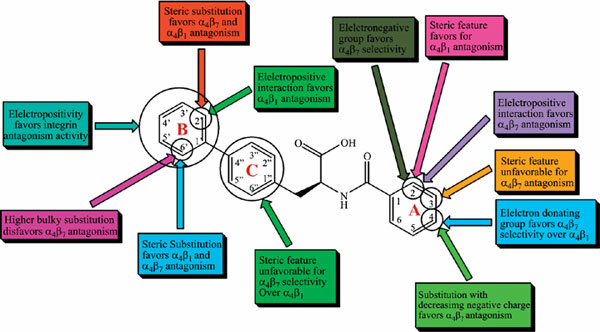 Important structural features required for higher α4β7 and α4β1 antagonistic activity of N-benzoyl-L-biphenylalanines were highlighted. This study may provide useful information regarding the overall structural aspects of integrins along with better α4β7 antagonists designing approaches in future. Keywords: Integrin, signaling, α4β7 and α4β1 antagonists, N-benzoyl-L-biphenylalanines, inflammatory bowel disease (IBD), atherosclerosis, Open3DQSAR. Keywords:Integrin, signaling, α4β7 and α4β1 antagonists, N-benzoyl-L-biphenylalanines, inflammatory bowel disease (IBD), atherosclerosis, Open3DQSAR. Abstract:Background: Complex integrin molecules, composed of eighteen α and eight β subunits, are responsible for modulating different signal transduction mechanisms across the plasma membrane. Two heterodimeric integrins, α4β7 and α4β1 are in the interest of researchers due to their immense importance in regulating a variety of inflammatory diseases such as asthma, rheumatoid arthritis (RA), inflammatory bowel disease (IBD), atherosclerosis and multiple sclerosis (MS). Small molecules α4β7 antagonists selective over α4β1 may be a safe and effective remedy for autoimmune disorders. Therefore, designing new small molecule selective α4β7 antagonists should have immense importance in anti-inflammatory and anti-cancer drug discovery.